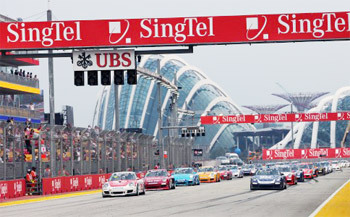 to Marina Bay for the 2013 FORMULA 1 SINGAPORE GRAND PRIX are in for a triple treat as two of the world’s outstanding race series, GP2 and the Porsche Carrera Cup Asia, return to support Formula One™ on the challenging Singapore street circuit in September. GP2 is widely recognised as the premier feeder category for Formula One™, as a quick look at the 2013 Grand Prix field will show: Mercedes duo Nico Rosberg – winner in Monaco in May – and Lewis Hamilton were the first two GP2 champions respectively, Sauber’s Nico Hülkenberg, Williams driver Pastor Maldonado and Romain Grosjean of Lotus took out the title from 2009-2011, and reigning GP2 champion Davide Valsecchi is the test and development driver for Lotus. 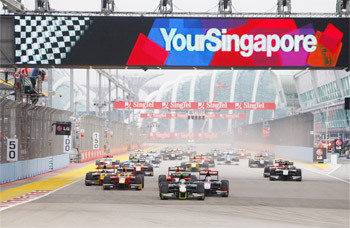 In 2012, when GP2 visited Singapore for the first time, the 31-lap feature race went to England’s Max Chilton, while Dutchman Giedo van der Garde won the 22-lap sprint. 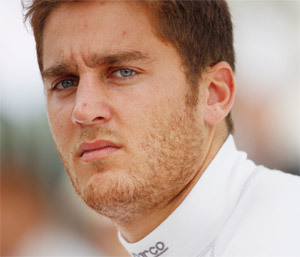 Both men are now fully-fledged Formula One™ drivers with Marussia and Caterham respectively. Singapore’s will be the 10th of 11 GP2 rounds in 2013, with 26 drivers vying for the crown. Monegasque driver Stefano Coletti (left) won the sprint race in his home town in late May to lead the overall standings on 120 points from Brazilian Felipe Nasr on 96, while their respective teams Rapax and Carlin are separated by a single point. The GP2 car is the Dallara GP2/11 powered by a four-litre, 612 bhp Mecachrome engine. Like Formula One™ cars they use a range of four Pirelli tyre compounds and are capable of top speeds around 330 km/h. is celebrating the completion of a decade of high-calibre sportscar racing in this part of the world – but Europeans and Kiwis are the dominant force at the moment, at least in the cockpit of the 3797cc six-cylinder machines. at three different venues was New Zealander Earl Bamber (right), now resident in Malaysia and racing for that country’s Nexus Racing team. 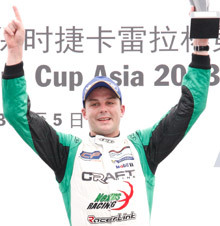 Bamber, 23, won both races at the third meeting of the season in Zhuhai to lead Martin Ragginger by four points. Ragginger, a 25-year-old Austrian, won the first three races of the 2013 series; Singapore fans will remember that he planted the Team Eagle entry on pole here last year before coming second to another New Zealander, Craig Baird, in the 12-lap race. With all drivers racing in the universally popular Porsche GT3 Cup, based on the road-going GT3 RS, Porsche Carrera Cup Asia also spices up the action further with a Class B for non-professional drivers. Here it’s Singapore driver Yuey Tan who is flying the local flag, the Dorr McElrea Racing man currently second to Mentos Racing’s Egidio Perfetti, who is also based in Singapore, in that race-within-a-race. Tickets for the 2013 FORMULA 1 SINGAPORE GRAND PRIX race-weekend (20 to 22 September) are available for sale via www.singaporegp.sg, the ticketing hotline +65 6738 6738 as well as at all authorised ticketing agents. See Annex 1 for 2013 FORMULA 1 SINGAPORE GRAND PRIX race-weekend ticket pricing.